A patient can’t heal in the same environment which made them ill. I received a call from a woman, in her 60’s, living in Los Angeles and never before had I heard a woman so ready to purge her soul. Her voice was hollow, the sound of someone whose terminal illness had drug them through four rounds of chemotherapy and radiation. I could hear and sense her desire to explore alternative healing instead of traditional palliative care. We made plans for her to come in and, just like that, the day for her first session was here. She limped into my office with an unsteady, thin-frame that was shrouded by an oversized wig and gray aura. We settled in, cross-legged, facing one another as she threw off her hairpiece. She pulled her hoodie over her bald head with a huge smile–her humility was sweet and loving, despite her current state of health. She voiced her innermost secrets and presented her scarred over wounds. Her spirit was exhausted from a lifetime of allowing others to trample over her. I saw how her body was giving up the fight, as she cried to the depths of her being, unleashing decades of pain. Her father’s sexual abuse weighed on her soul. It was something she needed to release before she was able to move over, peacefully, to the afterlife. She needed to make peace with it and she did, beautifully. After the initial visit, she reported an intense wave of exhaustion. As we met a second time, it was tough for her to keep her eyes open. “Oh Gina, I don’t know what to do. The doctors, my brother and my friends can’t support me the way I need. You hear me. I don’t know what I am going to do. I know I can heal this,” she said with pure conviction. I believe she would have healed her cancer, too. She came in and laid her shadows out like a champ with clarity, strength, and commitment. This is what my deepest intuition had told me was necessary in order to reconnect back to life. But I began to become confused and frustrated: Was she living or was she dying? I thought her body could regenerate itself, yet she seemed to weaken with each emotional release. And at that moment, while lying on the table, she closed her eyes and gently burst into tears. To comfort her, I placed my hand on her belly and continued to hold the space for her to feel and release. In the silence, I heard a loud whisper in my left ear, “She’s too sick.” My heart sank because I knew there was something yet created which could have helped heal her body, but she’d run out of time and energy. In my mid-twenties, I completed a Hospice volunteer program. I was always fascinated with the afterlife and thought end of life could be a very beautiful time if we believed in the power of the spirit. For 15 years, I continued to learn from every single human being I had the pleasure of meeting. I cherish their wisdom and, in turn, passed it to others to guide them toward health. Over the years I said goodbye to quite a few people, but they taught me a little more of what the other dimension looks and feels like and how to earn our ticket to peace. This brave woman taught me that there’s a very specific window for healing oneself in the physical world. A certain time frame where the physical body can revert and regenerate the immune system; a place where one can begin to breathe in life again. This woman came in and did her soul work with gold stars. The spiritual work and emotional release is typically the most difficult for patients with cancer. She was a warrior. Unfortunately, she still needed a holistic emergency room to stabilize her. 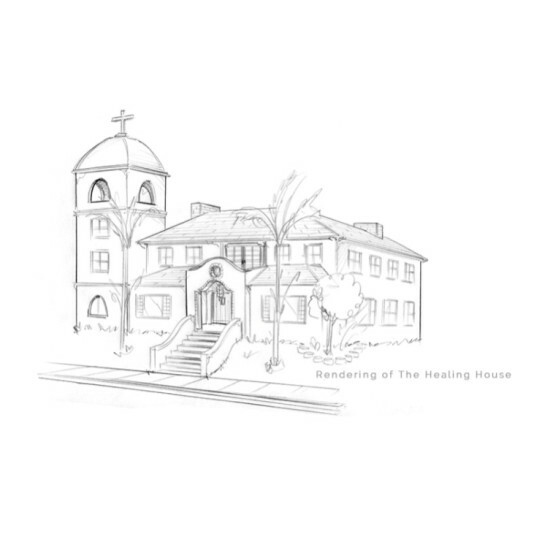 The Healing House is a spiritually attuned sanctuary to balance the deepest part of ourselves: no wires, no medication, no tests. Patients here need castor oil packs on their belly, intravenous alkaline foods, spinal adjustments, energetic balancing, physiological detoxing, rest and sunshine. Here you do the work necessary to find health in your soul and learn to breathe again. However, once you become centered and balanced it doesn’t necessarily mean you’re going to be cured from your physical sickness, as I saw with my client. She craved a New Way to Die. The Healing House would have given her the space she needed in order to surrender and settle unfinished business. Whether it was with her loved ones or just internally, this house would have provided her with a safe space where she could decide if she wanted to continue on this earthly journey or to transcend peacefully to the other side. May her sweet soul rest in peace. I feel my hands buzzing as I write this story, full of power and advocacy to change medicine and healthcare and pioneer The Healing House. It’s not even her background that’s left an impression, but every single one of her actions that lead up to her transcendence. I know her force is coming through these words to create that metaphysical hospital. One that exists for every single human being to cleanse their soul and holistically detox their human body. It’s the only way we can truly elevate our humanity. We need The Healing House to right our soul to live or to transcend. Either way, the spiritual transformation must take place, we must transcend our wounds to wisdom. It could’ve saved her life. Onward, L. Thank you.